The Panthers team that won the Fours last year. It’s a very different team at a very different track, but team boss Carl Johnson insists Panthers are strong contenders to retain their SGB Championship Fours crown on Sunday. The city club are no longer hosts of an event they famously won in front of their own fans at the East of England Arena last summer. Redcar’s much smaller South Tees Motorsport Park is the new home of the annual contest which involves the leading four riders (barring injuries or unavailability anyway) of all 11 clubs in the second tier. Ulrich Ostergaard is the only surviving member of the successful 2017 quartet. He is set to be joined by number one Scott Nicholls, in-form Michael Palm Toft and recent signing Bradley Wilson-Dean with short-term capture Ellis Perks acting as reserve. And Johnson reckons it’s a line-up capable of mounting a strong challenge for back-to-back successes with a recent league victory at Redcar arguably a good omen. 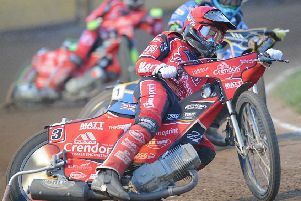 He said: “It’s a different track, a different format and we’ve got a different team, but we’ll go to Redcar looking for the same result as we had in the Fours last season. “Winning a major trophy in front of our own fans was easily my best day in speedway. “We are a long way from home this year, but it would be just as special to win it once again. “The fact we rode at – and won at – Redcar last week should work in our favour. In a tweak to the format for 2018, all teams are involved in the same qualification group with the top four sides advancing to the final. Each club will feature in eight races during the 22-heat qualifier with all four riders making two on-track appearances each.